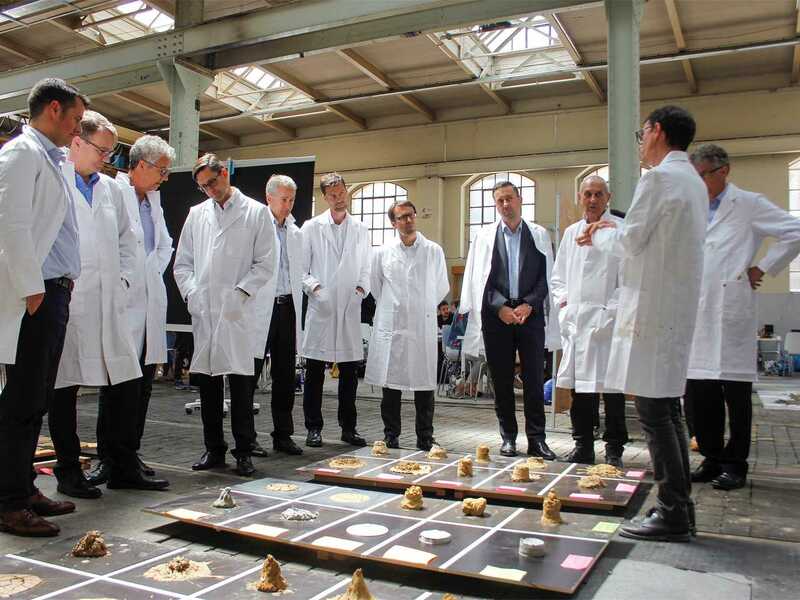 Examining slump test results (l-r): Simon Wiedemann, David Heron, Miljan Gutovic, Edward Schwarz, Urs Bleisch, Roland Köhler, Jens Diebold, Marc Angélil, Bernd Eitel, Simon Kronenberg, Guillaume Habert, and Nick Traber. 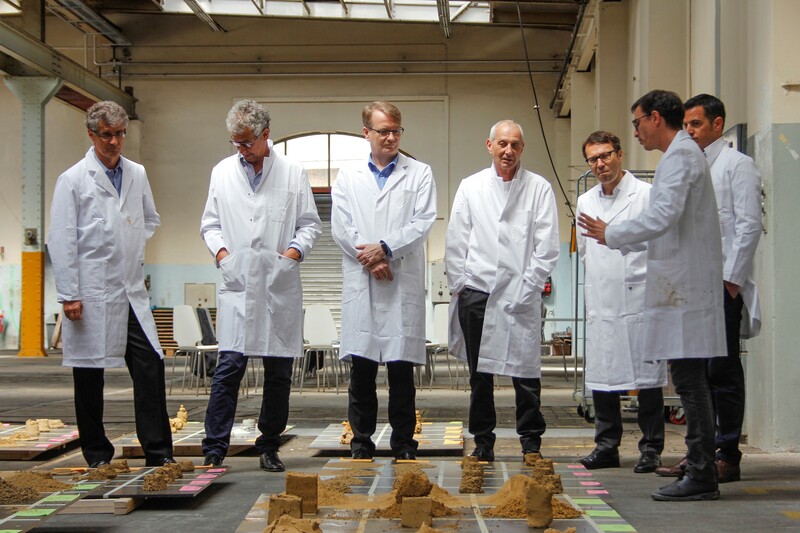 Considering alternatives to traditional construction materials (l-r): Urs Bleisch, Roland Köhler, Jens Diebold, Marc Angélil, Bernd Eitel, Guillaume Habert, and Simon Kronenberg. 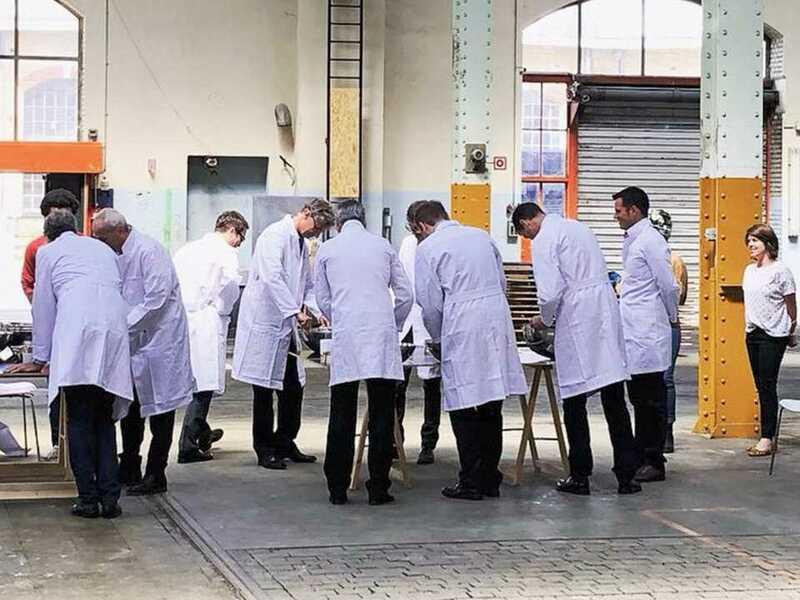 Mixing various building products and experiencing the result of their work immediately (l-r): Simon Kronenberg, Jens Diebold, Roland Köhler, Nick Traber, Simon Wiedemann, David Heron, Bernd Eitel, Miljan Gutovic, Marc Angélil, Guillaume Habert, and Urs Bleisch. 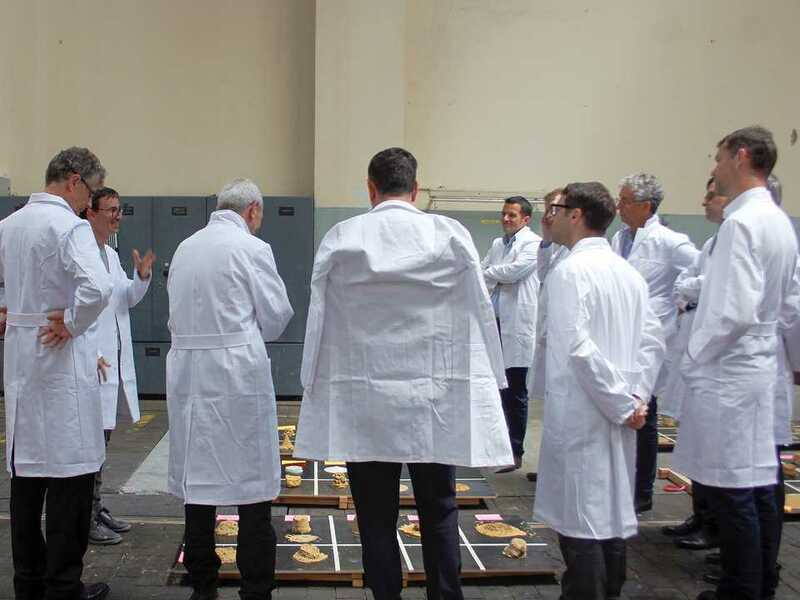 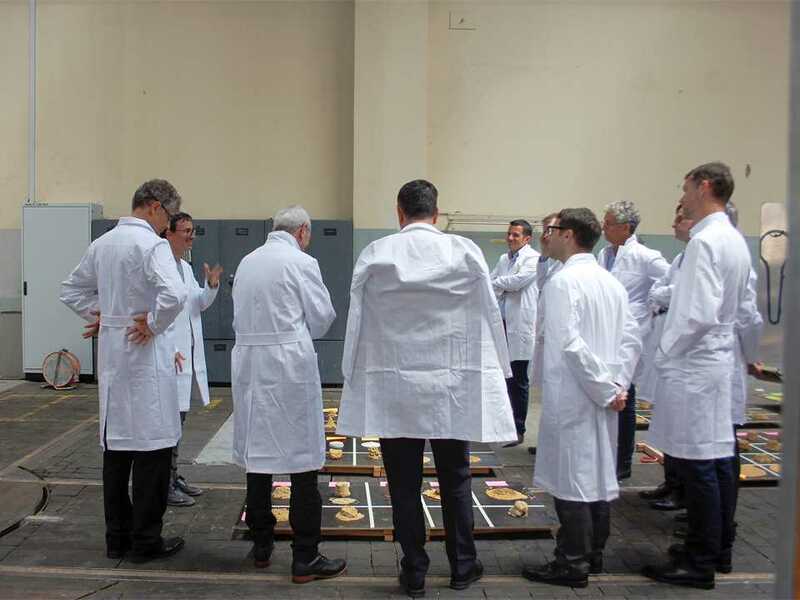 Instead of a theoretical presentation, the participants were invited to put on lab coats and conduct the “Habert test” hands-on by mixing various building products and experiencing the result of their work immediately. 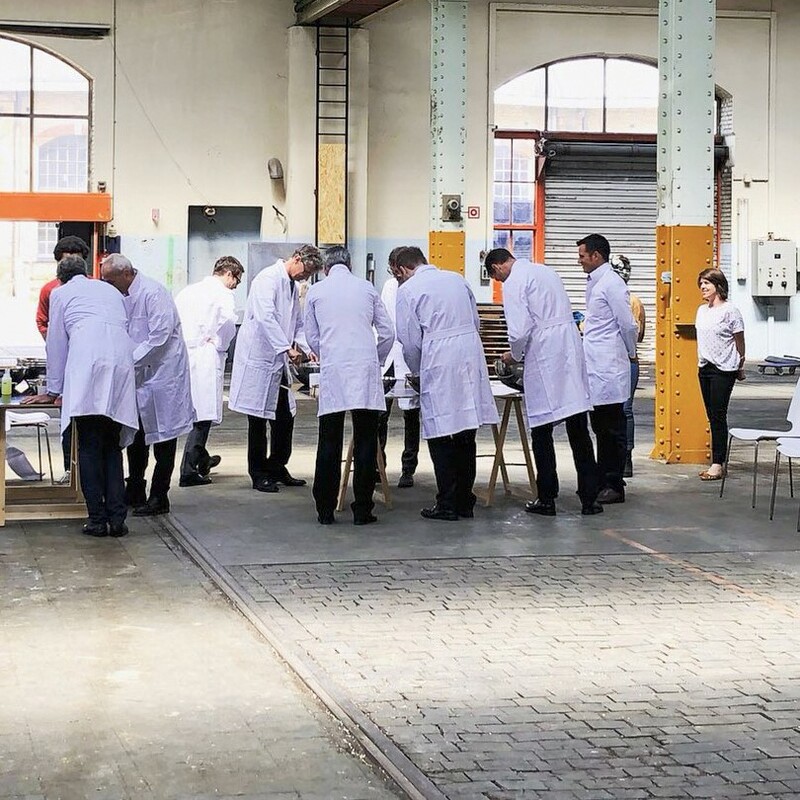 An additional stop in a former railway maintenance hall in Zurich-Altstätten visited the summer school of the Chair of Sustainable Construction at ETH Zurich that is working on optimizing a construction project for the Swiss Federal Railways. 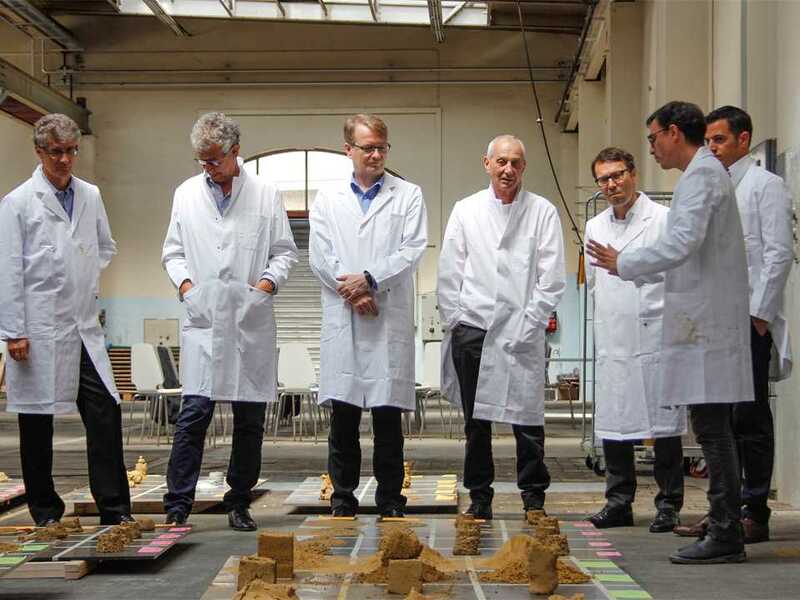 The experiment displays some fundamental concepts that must be considered when designing a concrete mix. 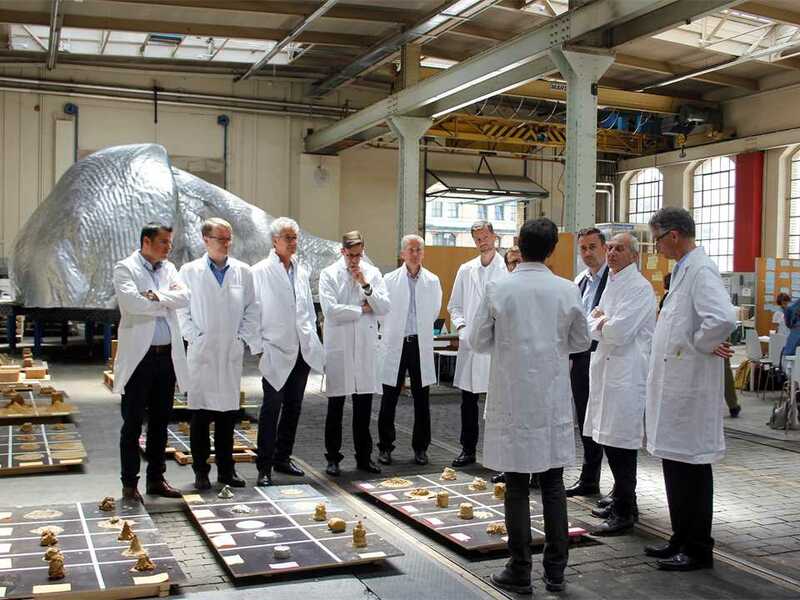 Top managers of LafargeHolcim and Holcim Switzerland were introduced to state-of-the-art research on sustainable construction and materials technology across Switzerland at the NEST Building at Empa Dübendorf (Swiss Federal Laboratories for Materials Science and Technology), the Arch_Tec_Lab for interdisciplinary research at ETH Science City in Zurich, the Smart Living Lab of EPFL in Fribourg as well as the Laboratory of Construction Materials EPFL in Lausanne. Instead of a theoretical presentation, the participants were invited to put on lab coats in a former railway maintenance hall in Zurich-Altstetten, where the summer school of Guillaume Habert is working on optimizing a construction project for the Swiss Federal Railways. 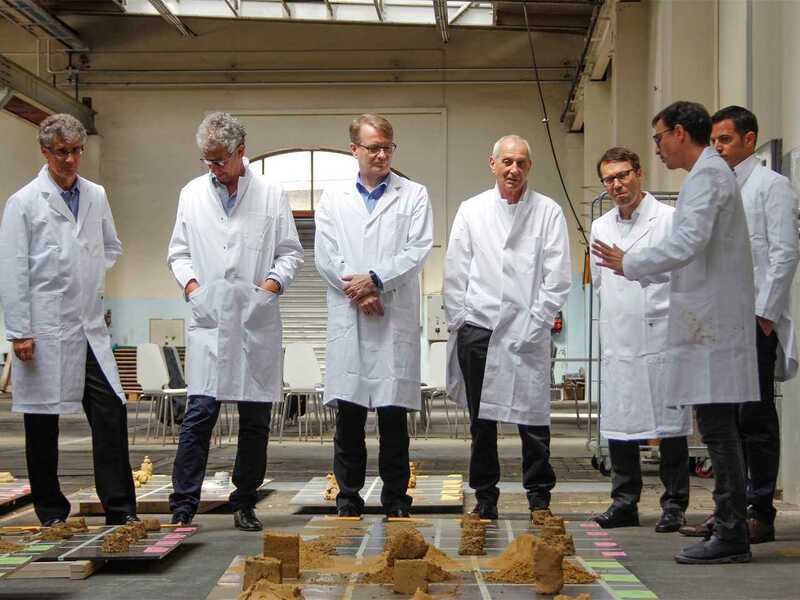 Professor Habert is Chair of Sustainable Construction at Swiss Federal Institute of Technology in Zurich (ETH Zurich), a research position that was initiated and continues to be sponsored by LafargeHolcim. 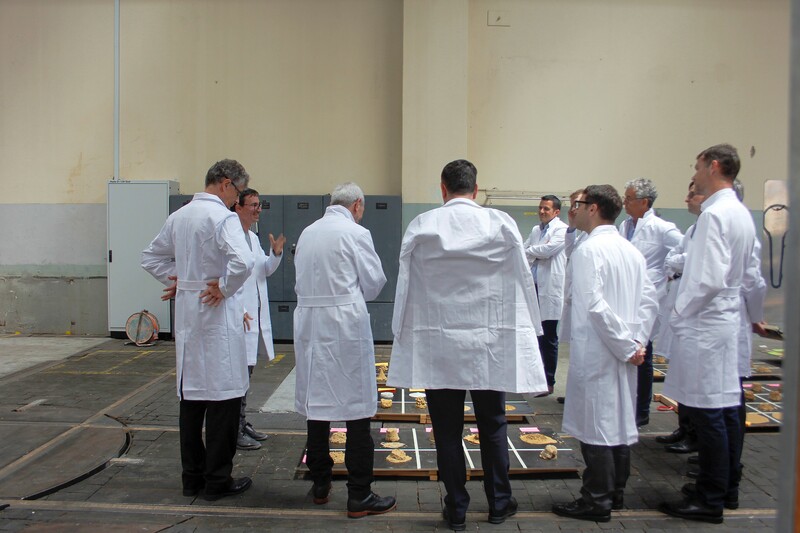 LafargeHolcim top managers Urs Bleisch, François de Larrard, Jens Diebold, Bernd Eitel, Miljian Gutovic, David Heron, Roland Köhler, Simon Kronenberg, Nick Traber and Simon Wiedemann were invited to conduct the “Habert test” hands-on by mixing various building products and experiencing the result of their work immediately. This test is used to study the behavior of a mix composed of a paste (fine grains and water) and gravel. 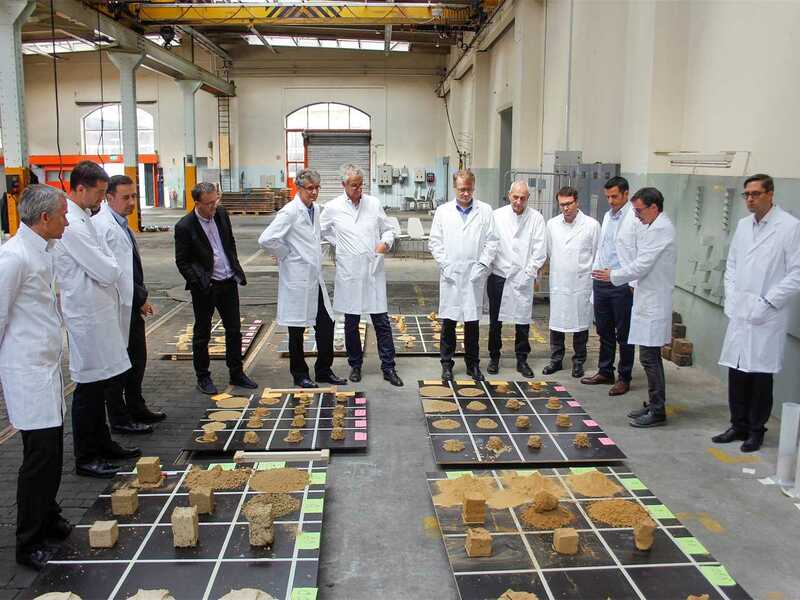 Samples of the mix are produced in a range of proportions and slump-test samples arranged in a matrix for comparison. 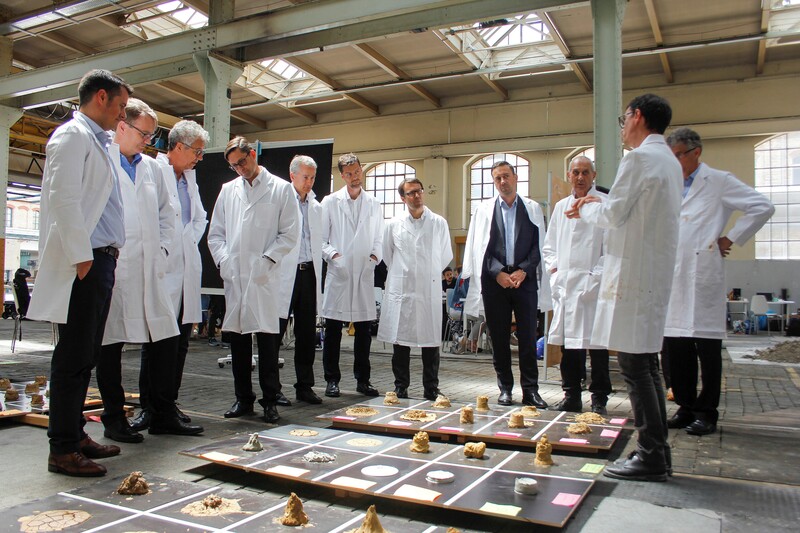 Along one axis of the matrix the amount of water in the paste is increased, and along the other the proportion of gravel. 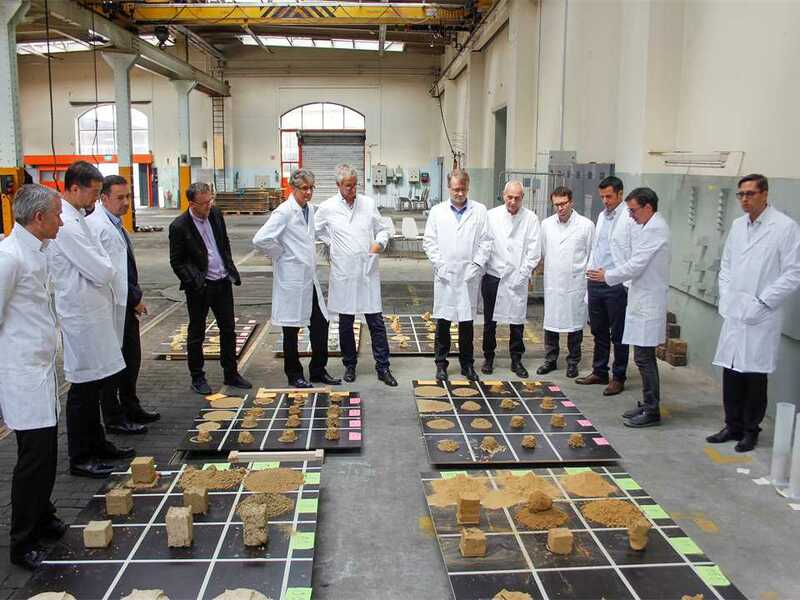 The test displays some fundamental concepts that must be considered when designing a concrete mix. The Habert test can be used for any material composed of grains (including gravel, steel fibers, and straw) and a paste made of water and fines (cement, clay, lime, gypsum). 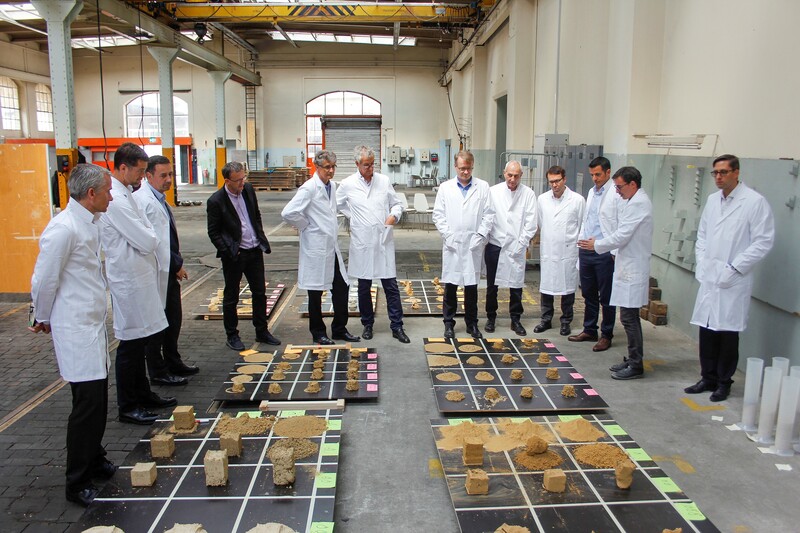 The comparative slump test is typically used to study clay concrete parameters. A similar test, called the “Carazas test” (named after the Peruvian architect Wilfredo Carazas), is used to study earthen construction parameters, and shows the diversity of materials that are under considerable investigation. 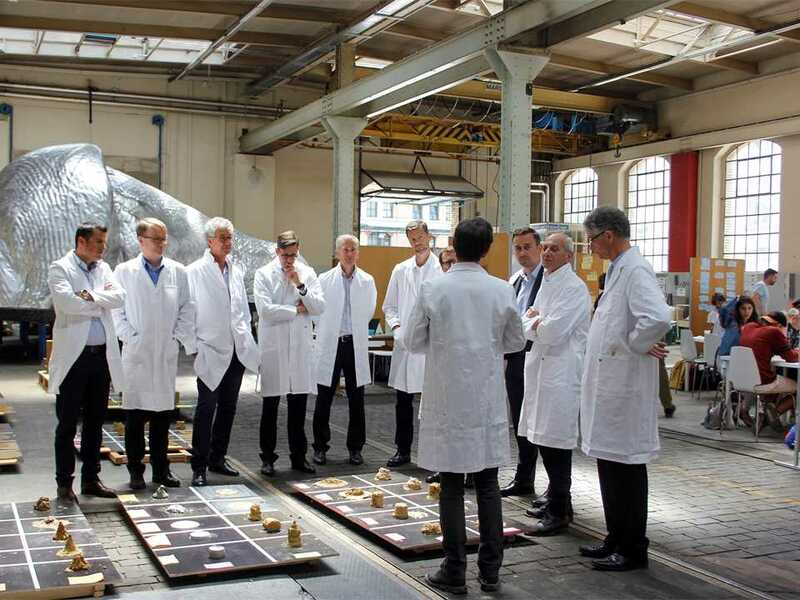 Some combinations of materials and technique enable a reduction in the amount of cement used to reach similar results as achieved with traditional concrete. 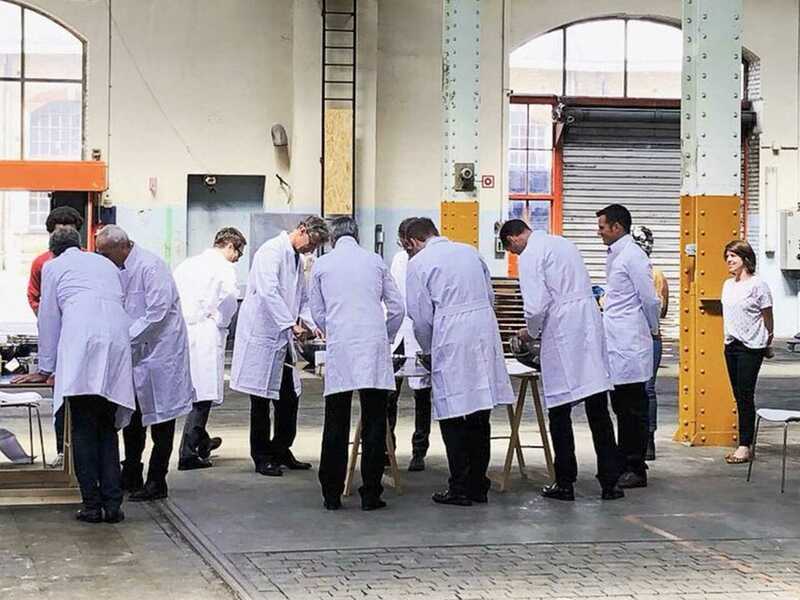 This innovation drives changes in the building materials industry in line with the growing demand for more sustainable construction: a challenge LafargeHolcim is living up to by providing innovative products and building solutions with a clear commitment to social and environmental sustainability. 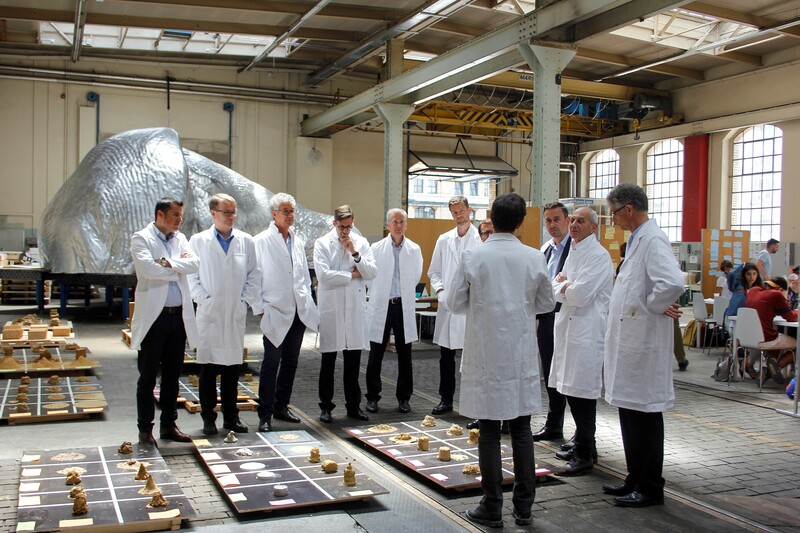 Presenters at the full-day trip organized by the LafargeHolcim Foundation for Sustainable Construction included Anne-Claude Cosandey, Coordinator Smart Living Lab, EPFL Fribourg; Enrico Marchesi, Innovation Manager NEST, Empa Dübendorf; Karen Scrivener, Professor & Head of Construction Materials Laboratory, EPFL Lausanne; as well as by three members of the Board and all members of the Academic Committee of the LafargeHolcim Foundation: Marilyne Andersen, Professor of sustainable construction technologies; Dean ENAC School, EPFL Lausanne; Marc Angélil, Professor of Architecture & Design, ETH Zurich; Philippe Block, Professor at the Institute of Technology in Architecture, ETH Zurich; Harry Gugger, Professor of Architecture and Chair Laboratoire Bâle, EPFL Lausanne; Guillaume Habert, Professor of Sustainable Construction, ETH Zurich; and Dirk Hebel, Professor of Sustainable Construction, Karlsruher Institut für Technologie.